Physical therapy is not fun. It’s hard work — tearful, painful work. Namine is a hard worker, but even she has her limits, so Jessica and I do what we can to make it enjoyable. Namine only has physical therapy once a week, but in the interests of building strength and endurance, we help her to work on the same things as her therapist in whatever we can. There’s a fine line, I suppose, between physical therapy and just plain ol’ being active around the apartment. When Namine does things that help to build her strength or endurance (or hey, why not both), I admit I don’t really think we’re doing physical therapy now. I just want to help my daughter be more independent, which is her own goal as well. There are things that I used to do for Namine that she now does for herself. These are just normal, everyday things, but in taking charge of them herself, she’s not only getting stronger but also becoming more independent. These mostly involve climbing in some way — into the car, onto the toilet, or into the bathtub. These everyday things aren’t fun, but being able to do them herself does give Namine a sense of pride. There is pleasure in accomplishment, and that is Namine’s alone as she becomes more independent. But there are things we do with Namine that are actually fun, too. A big one is playing on the Wii Fit. Its balance board is made for people to stand on — with a couple exceptions, that’s really its only purpose — and other than the initial weigh-in when you start your session, it can be used with a walker with little to no problems. Due to the nature of her legs, Namine can’t play all the games on the Wii Fit, but there are quite a few that she can: balance games, such as table tilt and the slalom; and movement games, such as the hula hoop and running. She doesn’t play all the games in her walker, either; some of the balance games are good core workouts for her sitting on the board, too. Until a short time ago, I would have told you that the Wii Fit is the only game we use for Namine’s therapy. 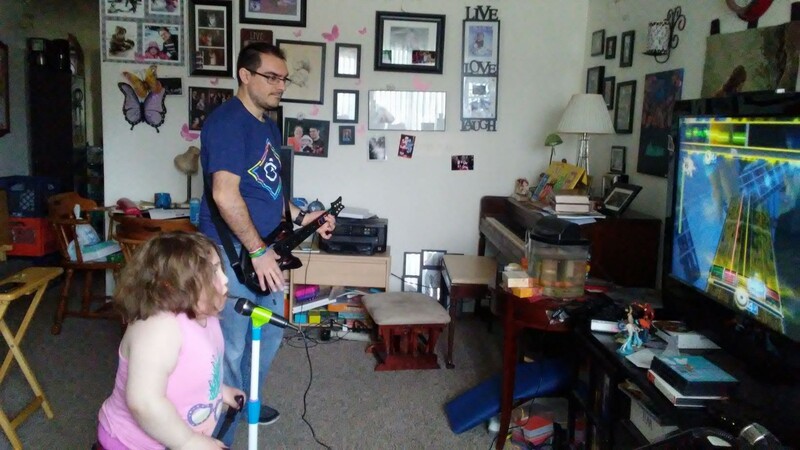 But last time we fired up Rock Band, Jessica had the great idea of setting up Namine’s microphone stand in front of her walker. It’s a great workout for Namine to stand up and sing at the same time, and she loves it. Of course, there’s no substitute for getting outside and moving around — when the weather permits it, of course. In warmer weather, we’ll go outside and Namine will walk in her walker up and down the driveway. There is also a park less than a mile away from our apartment, so we’ll go for a walk, with Namine riding in her hand crank bike or her wheelchair. And in September, we gather as many people as we can — mostly friends and family, but we did manage to get friends of friends last year — and participate in the Briggs and Al’s Run and Walk.